Buy online 2 Channel 5 Volt Isolated Relay Module in India at low cost from DNA Technology, Nashik. These are optically isolated relay modules having 5 Volt cube Relays. 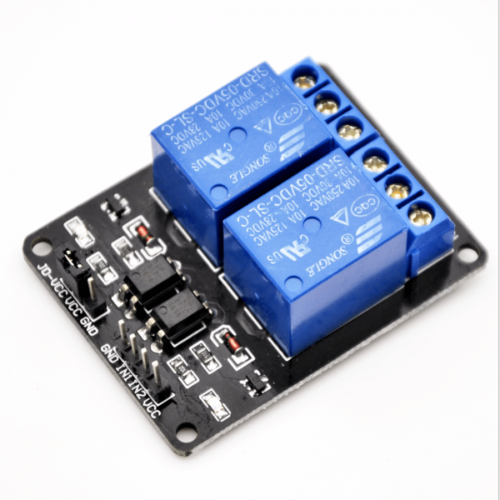 The relays are driven by a Opto-coupler which provides isolation between your Micro-controller, Arduino or Raspberry Pi & the relay thus making this module better that the modules having transistor or ULN2003 IC as drivers. This is a 2 channel Relay Module with output relay contacts of 10 ampere at 250 volts. You can use it easily with any Micro-controller, Arduino or Single Board Computers (SBC) like Raspberry Pi and Beagle bone. You can even use this module with digital IC's like LM555 of HT12D. 8-Channel 5 Volt Isolated Relay ModuleThese are optically isolated relay modules having 5 Volt cube ..
8-Channel 12 Volt Isolated Relay ModuleThese are optically isolated relay modules having 12 Volt cub..
4-Channel 12 Volt Isolated Relay ModuleThese are optically isolated relay modules having 12 Volt cub..
2-Channel 12 Volt Isolated Relay ModuleThese are optically isolated relay modules having 12 Volt cub..